Rebecca, Max, Noah, and Theo are reunited and on the run. The Master of Shadows himself is close behind. Nowhere is safe - monsters lurk in the water and on land, and the Shadow Spies strike at nightfall. All they have to guide them are the strange clues left by Grandpa Gabe. Can the four of them untangle Grandpa Gabe’s secrets in time? What will it cost them to stop the Shadows? Nykko is the author of several graphic novel series, including The ElseWhere Chronicles (Les Enfants d'ailleurs), originally published in French by Dupuis, which won the 2007 Lyon Festival Youth Prize. Nykko lives in Perros-Guirec, France. Bannister was born in 1973 and has been creating graphic novels since the age of 17. 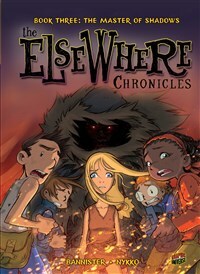 He is the illustrator of the popular Tib & Tumtum series andThe ElseWhere Chronicles series. His work has also appeared in Flight Explorer (Villard Books/Random House) and several editions of the Flight anthology.